When Brenda McLennan and James Smith decided to buy their first home, they were renting a small, rather dark flat in Bristol. Not surprisingly, they were looking for a property with more space and plenty of light, preferably with an outdoor terrace. The Victorian house, which included a small, self-contained annexe at the rear, had been a rental property for some time. It had seen little updating in recent years, so it needed a lot of modernisation. James agreed with Brenda that the house offered plenty of potential, so they put in an offer, which was accepted. ‘We decided to live in it for a while before making any major changes as it would give us time to firm up our plans for the house and raise funds for the renovation work,’ Brenda explains. In the meantime, they freshened up the dated décor and rented out the annexe to help with their refurbishment budget. ‘The reason the ground floor had been extended at the back and remodelled was to create the annexe and a new kitchen for the main house,’ says Brenda. When the couple started their renovation project five years later, they decided to demolish both the kitchen and the annexe. 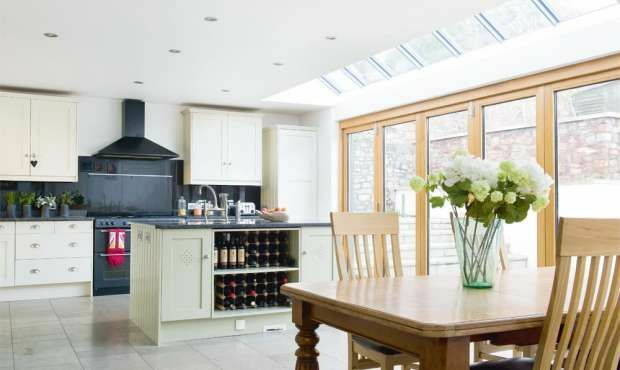 ‘In its place, we planned a two-storey extension for a new kitchen-diner and a utility room. We also wanted a larger ground floor living area, with five bedrooms in total on the first floor,’ Brenda explains. There were six bedrooms in the house, but two of them were on the ground floor. The couple decided to turn one into a home office and incorporate the other one into the living room. On the ground floor, the hallway and the former dining room would be turned into a larger hallway. The new kitchen-diner in the extension at the rear of the house would have a glazed roof and a wall of glazed folding sliding doors to flood it with natural light and link the inside and outside spaces. The steel support frame for the new kitchen space was designed by structural engineer John Hudd, who is a friend of Brenda and James. In the meantime, an architect friend, Roger Stephens, had drawn up their plans and submitted them to the local planning department. Although the couple’s main plans were firmly in place, they didn’t specify many of the finer details as they wanted to wait and see how the work progressed. Their flexible approach turned out to be a good decision. When the original drains were exposed, the couple discovered they were in disrepair so extra work was needed to update the entire system. ‘Our plans for one of the en suite shower rooms were scrapped when we realised that fitted wardrobes would be a more practical use of the space,’ Brenda recalls. Other changes to their plans included moving an internal wall by half a metre to ease the flow between the hallway and home office, which made a noticeable difference. The Victorian staircase was pulled down and replaced with a contemporary design to bring more light into the hallway. New heating, plumbing and windows were also factored into the project. Through his work as a surveyor, James was familiar with new energy-efficient technologies, and he was keen to introduce some eco-friendly features at home. James opted for a Rotex heating and hot water system that uses solar panels to harness energy, but it can also be supplemented with gas. It provides underfloor heating for both levels in the house, plus the floors and roof have been well insulated. Bespoke draught-proofed timber sashes with high-spec double glazing have replaced the old windows so that heat loss is minimal and there’s a comfortable even temperature throughout. Adding a contemporary extension to a Victorian house presented some decorating challenges. Brenda and James were keen that this new part of their home would have a bright, modern feel while still blending with the period style elsewhere. The kitchen is a mix of traditional and contemporary styles. By teaming classic units with the latest appliances, they have created a perfect scheme.